We’d love your help. Let us know what’s wrong with this preview of Stone Mothers by Erin Kelly. Marianne was never supposed to return to town, the town where she grew up in the shadow of the Nazareth Mental Hospital. Her mother may be suffering from dementia nearby, but she had thought she'd left that place, and its dark secrets, b Erin Kelly, master of suspense, returns with her next thrilling standalone featuring an abandoned mental asylum and the secrets it holds. To ask other readers questions about Stone Mothers, please sign up. “Sodomites. Pederasts. Deviants. Reproductive Control. Behavioral Correction.” All treatable at The East Anglia Pauper Lunatic Asylum established 1868. 2018: Marianne is horrified when her husband gifts her with a new home he purchased at Park Royal Manor. The Manor stands on the grounds of a former mental institution. It is also the place that holds Marianne’s deepest and darkest secrets from her past. 1988: Marianne and her boyfriend, bad boy Jesse, commit a crime that will haunt them for the remainder of their lives. 1958: Helen Morris commits a crime in the eyes of society and is sentenced to be treated at The East Anglia Pauper Lunatic Asylum. Told through the eyes of Marianne, Helen, and Honor, Stone Mothers offers an interesting take on the history of the Victorian mental asylum. The beginning of the novel moves at a very slow pace but gradually builds. I was ready to give up, but then at the 30% mark things finally started to get interesting with the transition to 1988 and Marianne’s past. In addition to different POV's, Stone Mothers is also split into different timelines. I loved the narrative structure and change in timelines. Helen’s character and the story were the most fascinating! I would have liked to spend more time with her character. At the same time, I could have done without Honor’s take on events. This is a slow, but fascinating read about Victorian mental hospitals. Helen’s chapter is riveting and serves as an interesting commentary on how mental health was regarded and treated in the past. However, as a whole, I was confused on what this book was trying to be: thriller, social commentary, an ode to motherhood and female friendship? In the end, the message got muddled and the plot fizzled out. Daniela Trivino Wow, your comments on both Helen and Honor’s parts echoed exactly what I was thinking, as I’ve just finished the book moments ago. I completely agree. Marialyce Sounds like quite an interesting premise but sorry it was somewhat disappointing, Meredith. Not sure if I will take this book on. Marianne’s husband wants to give a gift he’s certain she will love. A second home in the small town she grew up in! Surprise! What a loving gesture. Unfortunately, this is the place Marianne never wanted to step foot in again. A place where she and those around her have deeply-hidden secrets that if found out could destroy lives. This is a slower paced novel told from different perspectives through different timelines. For me, Helen's story was the most provocative and compelling! I would have loved for her to have remained the main focus from start to finish. I have to admit, in the beginning I had trouble following along. But as the timelines shifted, the story-line unraveled, I was pleasantly drawn into lives of the characters, anxious to see how it all would come together. This is the third book I’ve read from Erin Kelly, I felt it read more slowly than her previous releases but still found it an entertaining read that I would recommend! Melissa Another great review, Kaceey! Sorry to hear the pacing didn't match up to her previous releases. Kaceey Melissa wrote: "Another great review, Kaceey! Sorry to hear the pacing didn't match up to her previous releases." Thank you so much Melissa! Felt very Melissa wrote: "Another great review, Kaceey! Sorry to hear the pacing didn't match up to her previous releases." Secrets: Everyone has them. Some, are best kept hidden! Nazareth: It’s an eerie place. Creepy, dark and downright scary - it’s not a place I’d ever want to visit. Marianne and Jess were sweethearts once. Then Marianne ran off. Jesse always believed that he got the short end of the stick. That makes him a desperate man. Nowadays, Helen Greenlaw is extremely successful - and yet she is always afraid that the walls are going to come crashing down. Meanwhile, Marianne’s husband Sam, has quite the surprise planned, which makes Marianne scared straight. The ties that bind these three are oh so complicated when the past and the present collide! “Stone Mothers” is novel that features different narrators - with Helen being my favorite as I felt her story was the strongest and found her character to be quite intriguing. Having read a few of Erin Kelly’s novels, I think this was one had a different feel to it than her others - it was slow to start and then it took off, and that was thanks to Helen who stole the show. To be perfectly honest, the creepy, dark atmosphere of this one gave me the chills. I have a feeling that once you take a deep dive into “Stone Mothers” you’ll react the same way! This was another buddy read with Kaceey! Thank you to Allison Ziegler at Minotaur Books, NetGalley and to Erin Kelley for an arc of this novel in exchange for an honest review. Published on NetGalley, Goodreads on 3.24.19. The story is told from the viewpoint of Marianne in the present and then when she was seventeen, from the viewpoint of Helen from the time she was a teenager until her eighties, and from the viewpoint of Honor, Marianne's daughter, in the present. During the first section of the book, I was having a hard time getting into the book but once we got to Marianne's younger years, getting more background to the story made it more interesting, and then by the time we got to Helen's viewpoint, I was hoo The story is told from the viewpoint of Marianne in the present and then when she was seventeen, from the viewpoint of Helen from the time she was a teenager until her eighties, and from the viewpoint of Honor, Marianne's daughter, in the present. During the first section of the book, I was having a hard time getting into the book but once we got to Marianne's younger years, getting more background to the story made it more interesting, and then by the time we got to Helen's viewpoint, I was hooked. Helen's story is a sad one but I had trouble deciding if her cold parents led to Helen's inability to connect with people or if she would have been that way anyway. Whatever the case, what happened to Helen when she was young, was the catalyst for the things that happen later in the book. A lot of the story takes place in and on the grounds of an old asylum, while it was still in use as an asylum, while it was a decrepit and dangerous mess of rubble, and lastly rebuilt as luxury apartments and cottages. A young Marianne and her young boyfriend Jesse, blackmail politician Helen and this leads to the three being tied to each other for decades to come. So many lies tie them together and each are haunted by what happened in the past and the secrets that they try to keep under wraps. The character of Helen intrigued me the most but for all she had in her life and all she accomplished, the fact that she could not connect with other people meant she had nothing at all. I dnf'd this last december but after reading HE Said She Said (which was amazing) decided to try again and OMG! Glad I did. The start is slow but it's such a good read. 〰️Beth〰️ I have been debating this read myself. Thank you for the review. Meg Love her writing style and prose! This arrived then I read it. Because it’s Erin Kelly, author of now quite a few books that sit in my top reads of all time. Because I love the way she writes and the way she crafts her characters – especially that because truly, none of them ever leave me. Stone Mothers is an intense, intelligent and extraordinarily emotional novel that takes one unintentional outcome and shows the impact this has on those involved and those linked to them. Tracing a path back through time, pulling on a thread, un This arrived then I read it. Because it’s Erin Kelly, author of now quite a few books that sit in my top reads of all time. Because I love the way she writes and the way she crafts her characters – especially that because truly, none of them ever leave me. Tracing a path back through time, pulling on a thread, unravelling layers, this story is character driven drama at its very very best. It is nuanced and darkly observant, with those now very trademark “moments” I’ve come to associate with this author. MOMENTS not necessarily twists – where your heart stops for a beat or two and you have to just absorb the impact, accept the hit, remember to breath. Utterly compelling, where the things you think are true can be ironically turned around on you, with a beautifully complex and fascinating core and some plotting perfection, I loved this. Another one for that list. 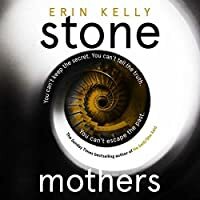 “They” say Crime can’t be literary and literary can’t be crime – well I say you can have the best of both worlds and here is Erin Kelly’s Stone Mothers to prove my point for me. Marianne's husband has surprised her by buying a second home in the renovated asylum near where she grew up. Unfortunately the building has very disturbing memories from her youth and this is the reason she left the area and had planned never to return. A slow paced psychological thriller with a few twist and turns. Thank you to NetGalley and Hodder & Stoughton for my e-copy in exchange for an honest review. enthralling, atmospheric, chilling, unsettling, and eye-opening! Erin Kelly has crafted a compelling story that starts with a whisper and ends with a shout. This is a slow burner that becomes more and more riveting as the story progresses. The story was cleverly constructed, Creating a constant air of mystery, and a continuous need to know. A story about living a life always fearing that the truth will come out. An institution that meant different things to different people. A real and raw look enthralling, atmospheric, chilling, unsettling, and eye-opening! Erin Kelly has crafted a compelling story that starts with a whisper and ends with a shout. This is a slow burner that becomes more and more riveting as the story progresses. The story was cleverly constructed, Creating a constant air of mystery, and a continuous need to know. A story about living a life always fearing that the truth will come out. An institution that meant different things to different people. A real and raw look at Women and mental health throughout history. The story jumps around in time and is told from multiple perspectives. The book opens with Marianne returning home to help care for her ailing mother. Her loving husband has a surprise for her, A luxury apartment to stay in rather than camping out on her sister’s couch. The thing is the apartment is located in a renovated mental hospital, The place where all Mariann’s secrets are buried. Home also comes with the risk of running into her ex-boyfriend Jessie who is still bitter and blames her for the past. The story then bounces back in time to 1988 where we learn what Marianne and Jessie were up to. Then we jump back even further to 1958 where we meet a young Helen. I felt structuring the story this way was tremendously impactful. We got to meet the characters and then we got to understand why they were the way they were and what their motivations were. I found all these characters compelling, but I have to admit I found Helen’s story the most intriguing. The treatment of women who did not conform in the 1950s and earlier, in both the UK and the US was disgusting and disturbing. You really got to know and understand all these characters perspectives. They all wanted different things for different reasons and a lot of these things were conflicting, but I completely understood where each of them was coming from. Didn’t always agree with their actions, but I understood their motivations. This was an extremely well done, genre defying book that I won’t soon forget! 🎧🎧🎧 this audiobook was narrated by three different narrator’s. Giving each character their own unique voice. I thought each narrator did a really good job. I need to give major props to whoever narrated Marianne she did an amazing Jessie voice. I think the English accents especially the regional accents really added to the overall atmosphere of this book. NZLisaM Sold! Love your review, Berit. 😊 Added this one to my tbr. Rounded up to 4.5 Stars for this slow-burning suspense! After reading He Said, She Said and being blown away, Erin Kelly immediately went on my list of authors whose books I had to read as soon as they came out. When I heard Stone Mothers was coming out, I knew I had to read it. I'm not going to completely retell the synopsis here because I think it gives the perfect amount of information for you to go into the book; honestly, it's best to go into this one a little blind as I think it is with all Rounded up to 4.5 Stars for this slow-burning suspense! I'm not going to completely retell the synopsis here because I think it gives the perfect amount of information for you to go into the book; honestly, it's best to go into this one a little blind as I think it is with all of Kelly's books. Marianne Thackeray, ex-boyfriend Jesse Brame, and now MP Helen Greenlaw have been entangled in a dreadful secret for over thirty years. Marianne thought she had escaped her past, but this shared secret and Jesse's deep-seated hatred of the woman who destroyed Nazareth Hospital, the mental asylum that employed most of Nusstead, could be her undoing. The secret is hinted at throughout the book, which is told in four different parts starting in the present, going back to the 1950s, and returning to the present day. I love Kelly's slow-burning style and each part not only begins to unravel the mystery but foretells what is to come next with an emotional impact that had me bracing myself. I will say the part written in the 1950s is my favorite of all even though it was gut-wrenching, horrifying, and sometimes hard to read. I cannot think of another author of this genre who makes me think of themes deeper than who committed a crime, but Kelly has a true knack for getting you to care about social issues and intensely reflect while these issues assault your thoughts. Before reading this, I had no idea "stone mothers" was another name used for mental hospitals in Victorian times. After reading the way mental patients were treated even into the late 1950s, the title took on a tragic and saddening meaning. More than writing a psychological thriller, Kelly has cleverly and deftly exposed the injustices and inequalities toward women, the mentally ill, and the poor. What Kelly does so well is write psychological suspense that's a perfectly paced slow-burn where the suspense gradually builds to its stunning climax. Stone Mothers is not only well-written, but Kelly writes beautiful prose that is literary and strikingly beautiful-this isn't just a suspense novel, it reads like literary fiction because it's elegantly nuanced, detailed, and multilayered with haunted characters and a twisted plot so intriguing that I couldn't put the book down. Of course, it's a book that I highly recommend and I cannot wait for Kelly's next book. ‘Stone mother’ was a Victorian term for an asylum. Such a building sits at the heart of this novel, looming large over the small Suffolk town of Nusstead and defining many of the characters’ lives. Having escaped her impoverished background, Marianne has tried to leave behind memories of her ex-boyfriend Jesse and the terrible crime they covered up together. With her mother declining due to dementia, however, Marianne is forced to return. Her wealthy husband Sam thinks he’s doing her a favour by ‘Stone mother’ was a Victorian term for an asylum. Such a building sits at the heart of this novel, looming large over the small Suffolk town of Nusstead and defining many of the characters’ lives. Having escaped her impoverished background, Marianne has tried to leave behind memories of her ex-boyfriend Jesse and the terrible crime they covered up together. With her mother declining due to dementia, however, Marianne is forced to return. Her wealthy husband Sam thinks he’s doing her a favour by buying a surprise pied-à-terre in Nusstead, but Marianne is horrified: the flat is in the former Nazareth Mental Hospital, now rebranded as ‘Park Royal Manor’. On top of that, Jesse is still around, and still exerting a magnetic pull on Marianne. What did the two of them do 30 years ago? And what links them to a successful (though widely loathed) politician, Helen Greenlaw? Stone Mothers unfolds its secrets very slowly. Rather than alternating chapters, it’s split into four lengthy chunks, so we have to read almost 100 pages of Marianne’s present-day situation (loaded with portentous references to Something Bad™ that happened in 1988) before there’s a flashback. This doesn’t feel like the best structure for a story that relies so heavily on events from a character’s past: by the end of Part One, I was getting so frustrated that I was close to giving up. Part Three, set in 1958, is the most compelling, mainly because it gives some context to the only character in the book I actually found interesting. The ending is as clever and satisfying a conclusion as I’ve come to expect from Erin Kelly, though it can’t fully make up for the general slowness and lack of originality. I don’t know what went wrong here, because I’ve consistently enjoyed Kelly’s novels. In comparison to most of her previous work, Stone Mothers is a bit... ordinary. There are some interesting themes, around the stigmas attached to mental illness and poverty, but these are hardly new ground for the genre. I feel like every other UK/US thriller in the past few years has involved someone who grew up poor returning to their small, insular hometown after achieving success/wealth (and, inevitably, having to face an awful secret from their past). I do enjoy this trope; I just expected something more from such an accomplished writer. If you haven’t read Erin Kelly yet, I recommend skipping this and trying one of her earlier books. The Poison Tree captures time and place so beautifully I can still easily call its setting to mind eight years after reading it. The Burning Air has one of the best twists I’ve ever read, a paradigm shift that changed everything I thought I knew about the story, a masterclass in how it should be done. He Said/She Said is irresistibly pacy and fantastically exciting, and the intriguing context of eclipse chasing makes it feel like something completely new. I received an advance review copy of Stone Mothers from the publisher through NetGalley. Poignant and haunting—Erin Kelly’s latest novel Stone Mothers has an elegance to it that is both poetic and dark. Things are not always what they seem in this novel, and it is sort of written as a novel in reverse, beginning in present day and then moving progressively backwards in time, before resetting back to present day. I found the characters in this novel absolutely fascinating, particularly the more we learned about their past. By about 35% I struggled to put this book down! The setting of Poignant and haunting—Erin Kelly’s latest novel Stone Mothers has an elegance to it that is both poetic and dark. Things are not always what they seem in this novel, and it is sort of written as a novel in reverse, beginning in present day and then moving progressively backwards in time, before resetting back to present day. I found the characters in this novel absolutely fascinating, particularly the more we learned about their past. By about 35% I struggled to put this book down! The setting of Stone Mothers really takes the trend of refurbishing old buildings into luxury apartments to a new level, as a former Victorian mental asylum is transformed into luxury accommodations. I thought the descriptions of the hospital, both before and after the renovations, were so vivid. This is the first novel I’ve read by Erin Kelly but she has a way with building a mental image of the scenes she describes. I found this book to be incredibly atmospheric, which really added to the suspenseful feel of this gothic thriller! We begin in present day, where architectural professor Marianne Thackeray is traveling back to Nusstead, the place where she grew up to visit her ailing mother. Marianne left Nusstead—a town built primarily around Nazareth Mental Hospital—at seventeen, with barely a backward glance. A few years before she left, Nazareth closed its doors for good—sending the town of Nusstead into an economic crisis as the majority of residents were left without work. But the building itself—called a Stone Mother due to the belief when it was originally designed that the building itself could offer therapeutic benefits to those suffering from mental illness—always held a strange fascination for Nazareth. It is the place she first fell in love, and also the place where her darkest secret lives. A secret shared with her then boyfriend, Jesse Brame, and politician Helen Greenlaw. Then in the third part we move even further back in time to 1958, when Helen Greenlaw was a young woman, and more secrets are revealed. Helen as a character positively fascinated me. I wish I could talk more about Helen, but I think there is little I can say without spoiling it for readers. And rest assured, you do NOT want to be spoiled on Helen’s story! From the turn to 1988 in Part 2 and 1958 in Part 3, readers will not be able to put this book down. Both storylines are complete engrossing, and tie together with one another in very intricate ways. I’m going to leave you there with this review… I absolutely loved this book! As some readers noted, it is a bit slow in the first part, because you aren’t really sure what is going on fully. That didn’t bother me at all, I found it very typical for a gothic thriller to begin slow and build up. My recommendation—get to know Marianne and Nazareth in Part 1. It all ties together in a fantastically intricate way!!! Thank you to the awesome team at Minotaur Books for my copy. Meredith Fabulous review, MacKenzie! I too found Helen’a character fascinating! This a novel that never quite reaches its full potential. First, on what I liked. I found the discourse on class and money (the way it can change you in ways that you might not be aware) to be very compelling. We see how money can distance you from your own family, your hometown, and even your younger self. The novel also does a brilliant job in evoking this small English community and of how unemployment can damage a family not only financially but emotionally (there is anger, shame, guilt, and pain). I also found it incredibly realistic the way in which Marianne's mother vascular dementia affected her loved ones. She only appeared in a few scenes but these were some of the few moments in which I felt emotionally involved by the story. Like many other reviewers, I found this book incredibly slow. I don't think that dividing it into four sections worked in the story's favour. It just created distance between each narrative (the first one is from Marianne 'now', the second is from Marianne as a teenager, the third is from a patient staying at Nazareth in 1958, and the last one is from another character). They seemed like these self-contained condensed stories that didn't merge well with one another. The first section stresses this 'big bad thing' that Marianne did...and when we actually get the details I felt underwhelmed. Other things happen but they never seem 'thrilling' to me. The suspense felt a bit forced (especially the final section when there is this unnecessary vagueness that seemed to exist merely to prolong the narrative). The characters...they occasionally seemed a bit clichéd but they did have 'moments' of credibility. Marianne was just plain awful. I disliked her not because of the 'big bad thing' but because she often sounded like a martyr.She is supposedly 'clever' and 'smart' (something which other characters, her degree, and her career, seem to imply) but to me she seemed anything but intelligent. She didn't even convince me in terms of her age. She is supposed to be in her later forties, she has managed to leave her small town behind, made her a new life for herself, etc. etc., and yet, she sounds exactly as experienced and self-aware as her teenage self. She was so naive, so irritatingly self-dramatizing, that she would been a more appropriate protagonist in an 18th cent. novel. I'm thinking something on the lines of Samuel Richardson's Clarissa, or, the History of a Young Lady. She spends nearly 60% of the book reproaching herself, bemoaning that 'big bad thing', her 'evil' deed seeps into her vision so that no matter her surroundings she will see a reflection her sins staring back at her (“The eels are back, and this time they’re sliding all over the sky”). Or she gives this dramatic descriptions: “His lips are white, like they’ve got bones in them.”. Jeez. When she spoke she did it with lots of exclamations marks (‘You saw her!’) and italics abounded, so that she often comes across as both juvenile and unrealistic. To begin with I thought that she was being sarcastic or disingenuous but she was turns out...she is just dense. The other two narrators were less irritating but I did find that one point of view sort of 'ruined' what could have been an interesting individual. I was hoping to read from the point of view of a calculating, ruthless, possibly psychopathic woman...but what we get is a sort of vindication where we learn that she isn't bad but simply (view spoiler)[unable to cry (hide spoiler)]. The last point of view is from a character who seemed an odd choice as she only appeared way back when in the first section. I think the book would have been more effective without this last section. The main male characters fell in one of the following categories: stupid, dull, w*nker. There were two male characters who were decent-ish but had brief inconsequential appearances. Marianne's relationship with her husband was one of the least convincing things in the story. They acted like they just met each other and I kept thinking that he was her second husband or something. They have no real history, their interactions kept making me question if they really had just met or something (when they have been supposedly married for 20 years or so). The storyline is so slow and uneventful that I was temped to abandon it once or twice. There were few moments that I found enjoyable and or entertaining...still, there were some nice descriptions and although I think this would have worked better if all of the narratives had been from the first point of view, I think that Kelly's writing has the potential to create a much more interesting story. The Victorians used to call their mental hospitals stone mothers. This book started off a little slow for me but the writing itself was so incredible that I continued on and am SO glad I did. Once you get to the big reveal it comes in like a wrecking ball and doesn't let up. You will think to yourself that some of the plot is predictable after that but you have to keep reading to see what other surprises the author will throw into the mix, and there are quite a few. Erin Kelly is an amazing writ The Victorians used to call their mental hospitals stone mothers. Erin Kelly is an amazing writer, this book...it reads like a true story; it does not read like fiction. This was a wonderful mystery that is told with insight and sensitivity. It was absorbing and was hard to put down for any length of time. The story is told bit by bit, so there's a constant tension that I really enjoyed. I was incredibly curious about Marianne and her secrets, and liked the suspense and mystery around it. I was especially blown away by the third part of the book. The characters are well flushed out, and you will either love them or hate them. This is a well written, emotional novel, and for the most part, Stone Mothers was a pretty good read. So, yes, I do recommend it and it absolutely deserves a four star rating. Thank you NetGalley, St. Martin's Press, Minotaur Books and Erin Kelly for the opportunity to read this book in exchange for an impartial review; all opinions are my own. The first book I ever read of Erin Kelly's was He/Said, She/Said in 2017 and this book also made my best of the year that year. Naturally, I've been excited to see what Kelly would follow up with ever since. Enter Stone Mothers. Marianne's husband has surprised her by purchasing them an apartment near her ailing mother, which also happens to be her childhood hometown - but, these apartments have been built where a now-defunct mental hospital used to be. Weird, to say the least. Marianne is extre The first book I ever read of Erin Kelly's was He/Said, She/Said in 2017 and this book also made my best of the year that year. Naturally, I've been excited to see what Kelly would follow up with ever since. Enter Stone Mothers. Marianne's husband has surprised her by purchasing them an apartment near her ailing mother, which also happens to be her childhood hometown - but, these apartments have been built where a now-defunct mental hospital used to be. Weird, to say the least. Marianne is extremely spooked by this but not just for the reasons you would think...as the story evolves, we learn Marianne's childhood sweetheart is a factor in this as well as a local politician. But what has them all so spooked and why? Told in 4 slow burning sections, Kelly weaves an interesting tale that focuses on mental health, coming of age, poverty, government overreach and more. If you are looking for fast paced excitement with twists and turns abound, this will not be the book for you, however, if you can appreciate the long haul and the well written mystery as it evolves, I think you will enjoy this one just as much as I did. When Marianne reluctantly returns to her hometown she is overcome with fear and despair. She will do anything in her power to keep the tremendous pain and secrets that have lied dormant in her past as far away from her husband and daughter. Erin Kelly's latest story centers around an abandoned mental hospital, the former patients, the suspicious deaths and those who were most traumatized. This thrilling suspense novel is for anyone who enjoys Ruth Ware. Stone Mothers is a fabulous read. I loved this layered novel, and the build up of the characters. The novel is centered around things which occurred at an old mental hospital. Erin Kelly is an author I will be looking for. I highly recommend this book! I'm going to put this one on the backburner for now, but will return back to it when the time is right. Erin Kelly is one of those authors who I will preorder books from without even reading the blurb. I was lucky enough to get a very early copy of Stone Mothers and actually started reading it without knowing anything about the plot beforehand (yes I was THAT desperate to get stuck in!!) And in a way I’m very glad that I chose to do so as it meant I had no preconceived ideas of what to expect from the storyline. It also meant that the slowly developed plot was able to keep me fully engaged as I re Erin Kelly is one of those authors who I will preorder books from without even reading the blurb. I was lucky enough to get a very early copy of Stone Mothers and actually started reading it without knowing anything about the plot beforehand (yes I was THAT desperate to get stuck in!!) And in a way I’m very glad that I chose to do so as it meant I had no preconceived ideas of what to expect from the storyline. It also meant that the slowly developed plot was able to keep me fully engaged as I remained in the dark about where it was heading and why. Erin Kelly writes the most beautifully poetic prose to accentuate her narratives and it’s no different here in Stone Mothers. The subject matter is a difficult one to convey without resorting to cliches but the setting of an old “mental hospital” worked well as the backdrop to the three main protagonists and their connection to each other. None of them are particularly likeable at the beginning of the book but when it takes a turn and works backwards to reveal the secrets being kept, gradually an understanding develops of why they made the decisions that they did. So please do stick with this if you feel that the pace isn’t as fast as you are used to, the payoff is fabulous! For me, Erin Kelly is a natural successor to one of my all time favourite authors Barbara Vine. I love her darkly disturbing twists that gradually creep up on you and wind tightly around your suspicions, squeezing until you can’t take anymore! But for me it wasn’t really about the “big event” that happened all those years ago, it was the backstory of one of the characters especially that completely involved me but made me so angry at the same time. That such things happened so recently in our society is unbelievable really but I know that things like this did occur regularly and Stone Mothers is very well researched so as to provide an accurate portrayal of the situation this character found themselves in and why. Past and present collide when Marianne returns home to help care for her ailing mother. She never expects her husband to surprise her with a second home on the grounds of a former asylum that holds secrets from Marianne’s past. STONE MOTHERS didn’t grab me the way I had hoped and I had difficulty getting into the complex backstory. Part of the reason may have been the quality of the galley formatting which had me stopping to be certain I was reading the actual next sentence of the manuscript. I had difficulty connecting to the characters and feeling invested in the story. The slow pace of STONE MOTHERS didn’t evoke feelings of suspense or intrigue, only questions of when I’d get to the end. Erin Kelly did create an intricate plot that touched on issues of mental illness, physical and emotional imprisonment, family, trust and honesty. Marianne and her husband move into a building (that was an asylum before). But she knows this asylum. Not because she used to live in the city. But because her secrets are buried there. I learned that while this book was a mystery, the core of the novel was about motherhood and how far a mother would go to protect her daughter. I love novels with a double genre because it makes it much more complex and visceral. I think that Kelly really floated the line between mystery and drama very well and I loved the novel even more because of that. Overall, a lovely novel and cannot wait to read more from Kelly! 20% read and all I've been given are lots of hints and allusions to something that happened "that day" - tedious, formulaic and overdone. First person, present tense narration. Really, it couldn't be more like every second "thriller" written in the last five years if it tried. I suspect, of course, that that is what it's aiming for. Success, then, for what it's worth, and I'm sure plenty of people will enjoy it. Not me, however. Abandoned. How far would you go to protect your secrets and your family? Three lives down different paths with one dark secret. Nearly thirty years later, it could all come to light and three individuals responsible each have their own demons to confront. I received an advanced read copy of this novel and was all but jumping to get into it as I tend to steer towards thrillers and suspense. The first part of the book was really slow. The drama thats going on doesn't have the same impact because you have n How far would you go to protect your secrets and your family? Three lives down different paths with one dark secret. Nearly thirty years later, it could all come to light and three individuals responsible each have their own demons to confront. With thanks to Netgalley and Hodder and Stoughton for this ARC in exchange for an open and honest review. 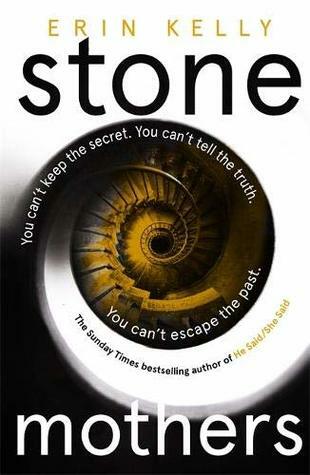 I was excited to read Stone Mothers after reading Erin Kelly`s last book He Said She Said. Marianne had grown up in the small town of Nusstead in Suffolk. She lived with her single mother and little sister Collette. At the time the main source of employment in the area was Nazareth Hospital (the local lunatic asylum as it was known). Marianne met her first love Jesse at school when they were both sent to lost property for replacement uniforms. During the evenings Marianne and Jesse hung around the disused hospital after it was closed by Helen Greenlaw who worked for the local health authority. One night a tragedy occurred that made Marianne leave Nusstead never to return. In the present day Marianne held a doctorate and was married to Sam and they had a grown up daughter called Honour. When Sam bought a second property she was horrified to discover it was part of the Nazareth Hospital. In the intervening years since Marianne had left Jesse had become very angry and bitter. Jesse threatened to tell Honour what happened at Nazareth to make Marianne leave. The plot was a slow burner and the story didnt really get going until the 40% mark. After that I was rapt and couldn't wait to read what would happen next. The story was told from the POV of Marianne, Helen and Honour at different periods in time. The plot was quite dark involving suicide and self harm. The most interesting was Helen`s story which began in 1958. The early part of her story was absolutely heartbreaking. It made me so angry because it happened to women in real life. I quite liked the young Jessie who was the youngest of three brothers. I admired his loyalty to his family and his wish to get the asylum re-opened so his father could get his job back. The descriptions of the derelict asylum were so chilling I could almost picture it. Despite the slow start I thought Stone Mothers was an excellent read. I highly recommend this book. It takes a while to get to the horror of what happened in the asylum. The novel was one I struggled to pu When I started Stone Mothers I wasn’t sure what to expect. Erin Kelly always manages to give the reader something different. What I got was a novel based around an asylum in Suffolk. It was one of those books that could have been set anywhere. The old asylums/hospitals were in many towns and their closures would have had the same impact that the closure of Nazareth had on the local community. I’m so glad I was able to get my hands on this ARC of “Stone Mothers” by Erin Kelly. Even though Marianne thought that what happened at Nazareth Mental Hospital was long buried in her past, all it takes is one gesture from her husband to bring it to the surface. Some things don’t stay buried forever. I really liked this book but I don’t know if the different sections of time and character point of views worked for me. It felt jumpy and I wondered if there was a way to have streamlined it more eff I’m so glad I was able to get my hands on this ARC of “Stone Mothers” by Erin Kelly. Even though Marianne thought that what happened at Nazareth Mental Hospital was long buried in her past, all it takes is one gesture from her husband to bring it to the surface. Some things don’t stay buried forever. I really liked this book but I don’t know if the different sections of time and character point of views worked for me. It felt jumpy and I wondered if there was a way to have streamlined it more effectively. Especially with that transition into the daughter’s voice and how quickly the action sped up at the end. Parts of it felt choppy, for sure. I don’t know what the author’s intentions toward Helen Greenlaw were (in terms of painting her as a villain) but I just felt sad for her. All she wanted was to pursue her ambition and she was thwarted at every turn. That’s how I felt about Marianne too, until she made a break from her relationship and pursued her goals. Overall, I think fans of Erin Kelly and “He Said/She Said” will enjoy this book. (This book was 3.5 stars for me but I rounded up since I liked it overall). Stone Mothers is another great read by Erin Kelly. Marianne escaped from her village at seventeen, taking with her a secret. Thirty years later, she is married with a daughter. But when her mother takes a turn for the worse, Marianne moves back to the village to care for her, willing to do anything to protect her family from the secret that has haunted her for 30 years. A slower paced thriller than I'm used to but still very good. Stone mothers is a phrase used in victorian time for Asylums and this book is set around an Asylum. Marieann moved out of her home time to get away from a past she didn't want to remember. Years later unbeknown to her, her husbands buys a second home in the now renovated plot where the Asylum once was. Heading back to her hometown throws up all sorts of memories she can now not run away from. Written over three timelines this thriller A slower paced thriller than I'm used to but still very good. Stone mothers is a phrase used in victorian time for Asylums and this book is set around an Asylum. Erin Kelly was born in London in 1976 and grew up in Essex. She read English at Warwick University and has been working as a journalist since 1998. She has written for newspapers including the The Sunday Times, The Sunday Telegraph, the Daily Mail and the Express and magazines including Red, Psychologies, Marie Claire, Elle and Cosmopolitan.